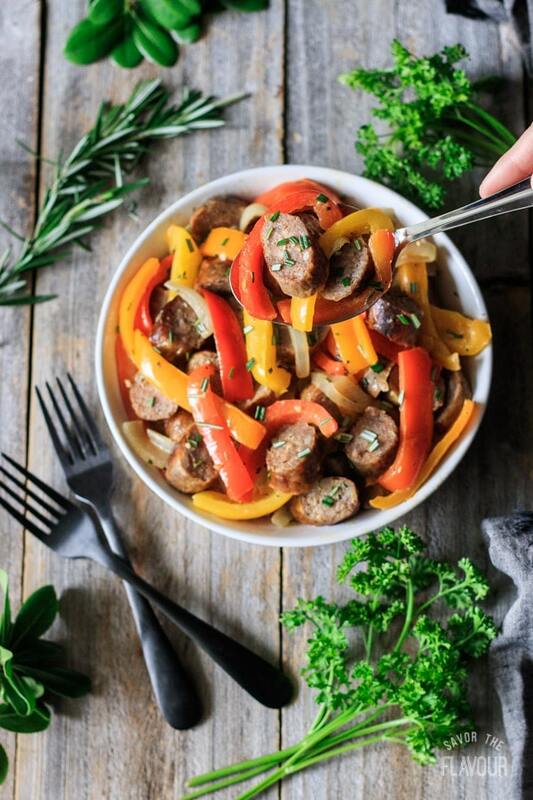 Low carb Italian sausage, peppers, and onions is a healthy one hour dinner recipe that will quickly be one of your family’s favorite comfort foods. 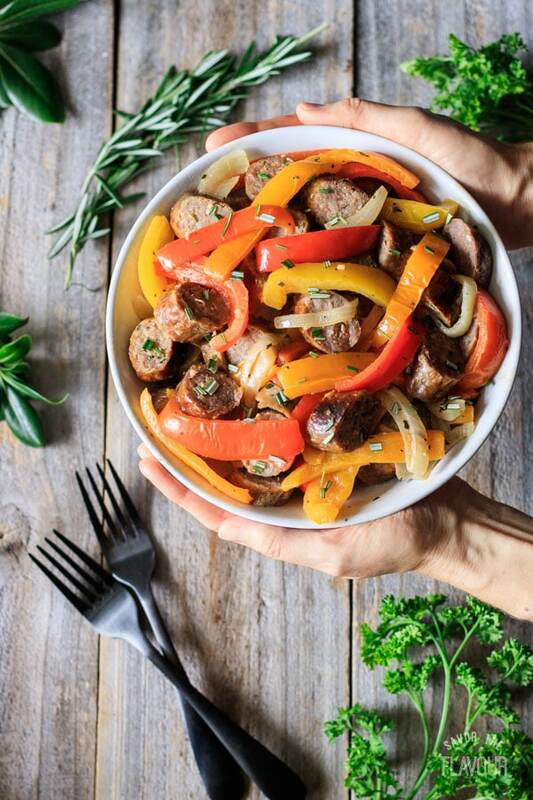 Cook it in a skillet or on a sheet pan—either way it's an easy meal that combines sweet and mild sausage with yellow, orange, and red peppers. It's simple and delicious! This post was originally published on January 8, 2018. 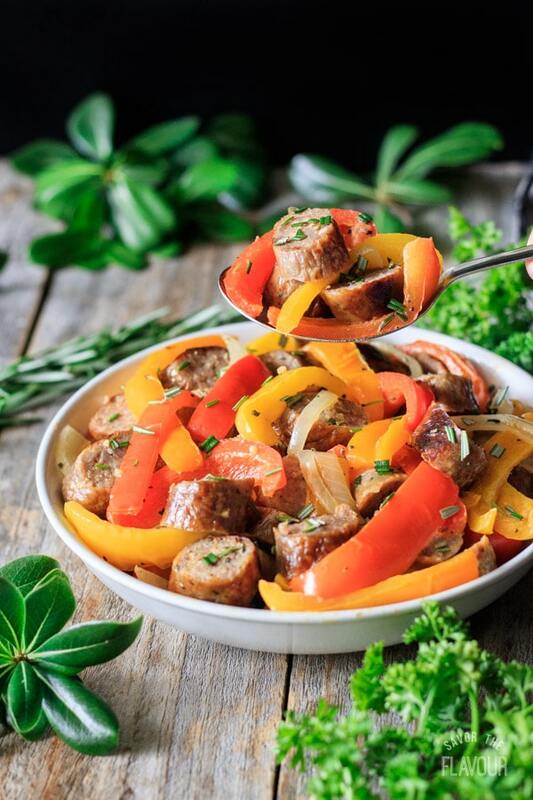 Low carb Italian sausage, peppers, and onions is a fantastic weeknight dinner option. This dish comes together in one hour and can feed a hungry crew of meat and veggie lovers. 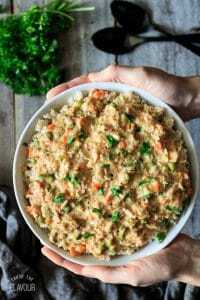 I’ve been making variations of this recipe for years because it tastes delicious, is simple to prepare, and is healthy. 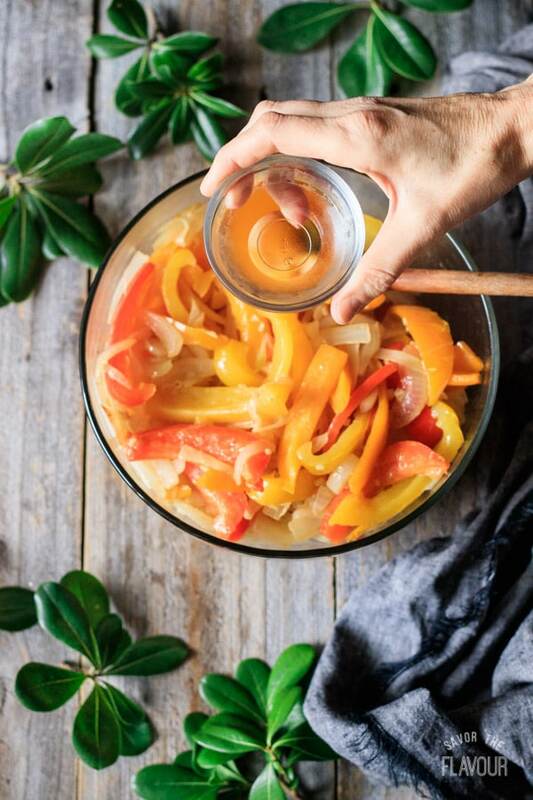 The vitamin C in this recipe is almost 3 times your daily dose due to the red, yellow, and orange sweet peppers. 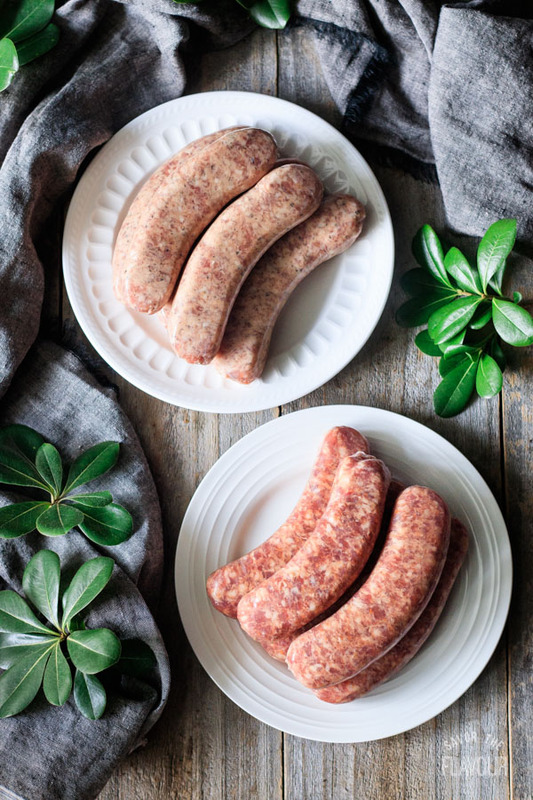 Plus, this recipe is packed with protein, and combines both sweet and mild Italian sausage to intensify the flavor. 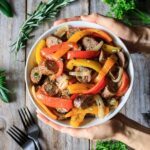 What should I serve with Italian sausage, peppers and onions? If you want to keep it low carb, serve it with mashed cauliflower, a salad, fried eggs, or fresh tomato wedges. If you’re not on a low carb diet, serve it with rice, pasta, polenta, or on a hoagie roll with provolene cheese and fresh basil. Slice the sausage, peppers, and onions, and peel the garlic cloves. Place on a baking sheet. Drizzle with oil, sprinkle the spices on top, and toss to combine. Bake at 400 F for 40 minutes, or until the sausage is no longer pink inside. Stir halfway through cooking. 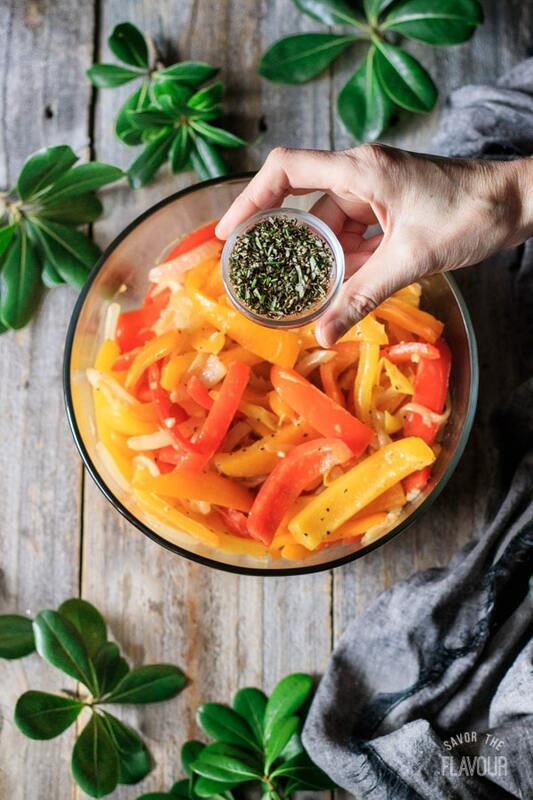 Transfer to a bowl and toss with white wine vinegar and garnish with fresh rosemary. Add 1 1/2 teaspoons of olive oil to a large skillet set over medium high heat. Add sausages and brown on both sides, but not entirely cooked through. Remove from heat, let cool, and slice on the bias. 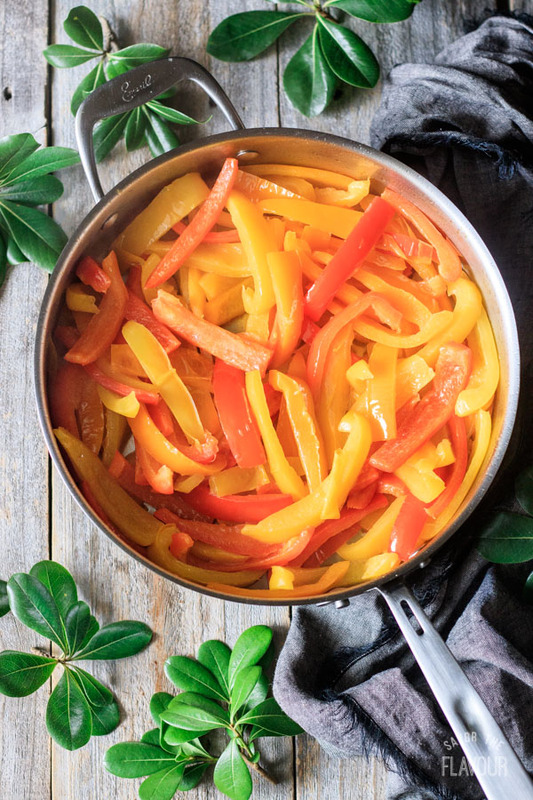 In the same skillet, cook the onions, peppers, and minced garlic in the rendered fat or oil. Sprinkle with salt and pepper. Return sausage to pan, cover, reduce heat to medium low, and simmer for 15 minutes or until sausage is done. Transfer to a bowl. Drizzle on white wine vinegar and garnish with fresh rosemary. This option is great if you are having a picnic or camping. Heat a gas grill to high and grill the sausages. Put the cooked sausage on top of a large piece of foil. Add sliced peppers, onions, and peeled smashed garlic cloves, then drizzle oil and spices on top. Fold packets to seal, then grill for 13 to 15 minutes or until vegetables are tender. To finish, drizzle on white wine vinegar, and garnish with chopped rosemary. Select what kind of Italian sausage you want. I used half sweet and half mild. Preheat your oven to 350 F. Line a baking tray with foil. Prick the sausage with a fork to let the steam escape. Cook for 50 minutes at 350 F or until no longer pink inside. Allow to cool for a couple of minutes then cut the sausage on the diagonal. 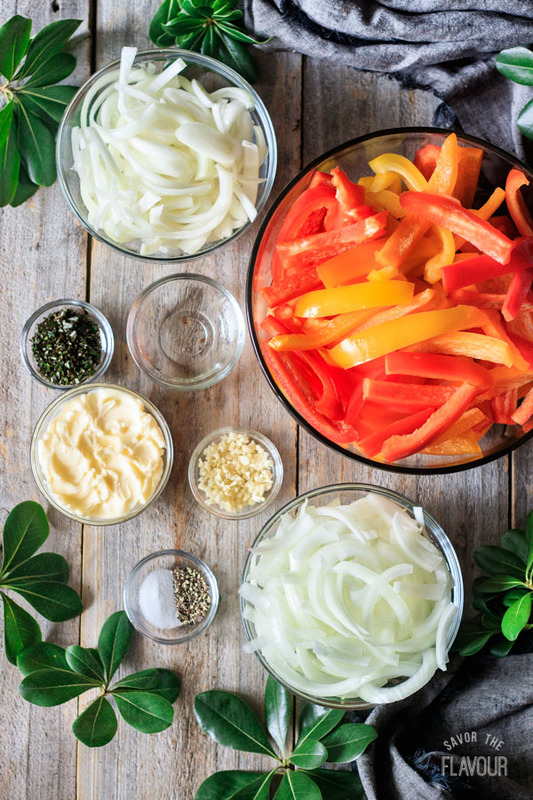 While the sausage cooks in the oven, prep the rest of your ingredients. Slice the onions and bell peppers and mince the garlic. One technique for slicing bell peppers is to cut the top off first then remove the seeds and membrane with a grapefruit spoon. Slice into 1/4 inch strips lengthwise. Remove from skillet and place in a large bowl. In medium sized skillet, melt 2 tablespoons of butter over medium high heat. Saute the onion for a few minutes while stirring then add the minced garlic. 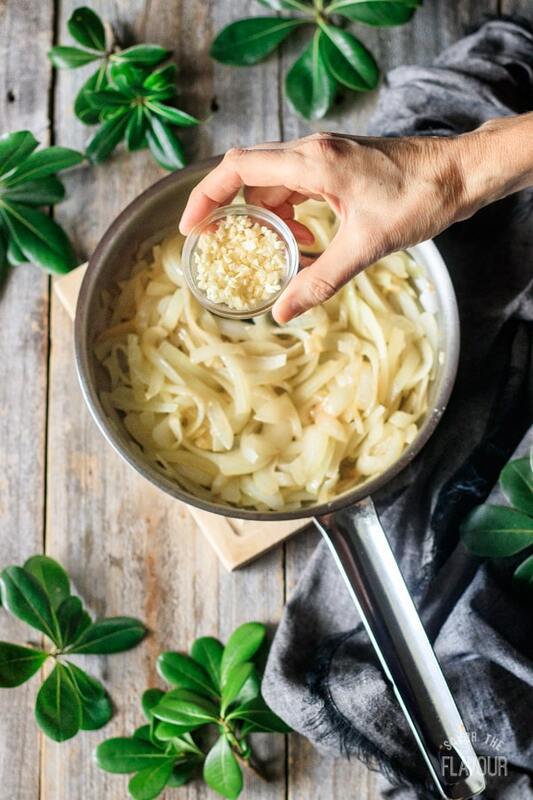 Cook the minced garlic for one minute or until fragrant. Place the onions and garlic mixture in the bowl with the cooked bell peppers. Add 2 tablespoons of white wine vinegar. Add a bit of salt and black pepper to taste. Add the chopped fresh rosemary. Reserving a little for garnish. Stir until well combined. Add the freshly bias sliced warm sausage to the bowl of peppers and onions and stir gently. Garnish with a sprinkle of chopped fresh rosemary. Prefer the sausage with a tomato sauce? Add red wine, tomato paste, diced tomatoes, balsamic vinegar, basil and oregano to a skillet after the veggies are cooked. Cook 5 minutes, then pour over cooked sausages. Want it spicier? 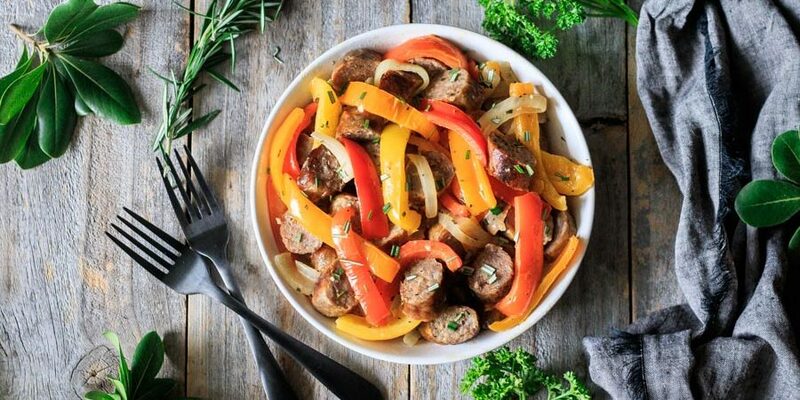 Use hot Italian sausage, and add a sprinkle of crushed red pepper flakes. Want to change up the spices? Use oregano, basil, or parsley. 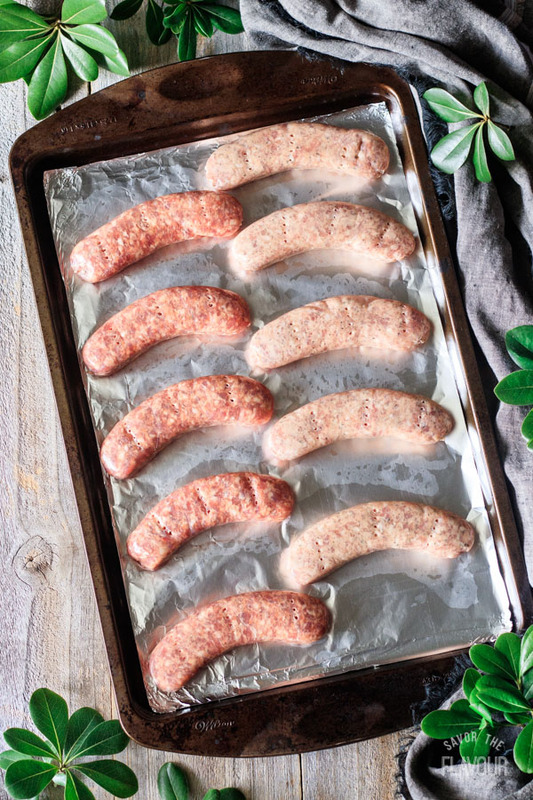 Slice the sausage when it’s slightly frozen prior to cooking to make it easier to cut. Want to deglaze the skillet for extra flavor? Use white or red cooking wine or chicken broth. Want other vinegar options? Try balsamic or red wine vinegar. Looking for other garnishes? Chiffonade fresh basil, or sprinkle on freshly grated Parmesan cheese. 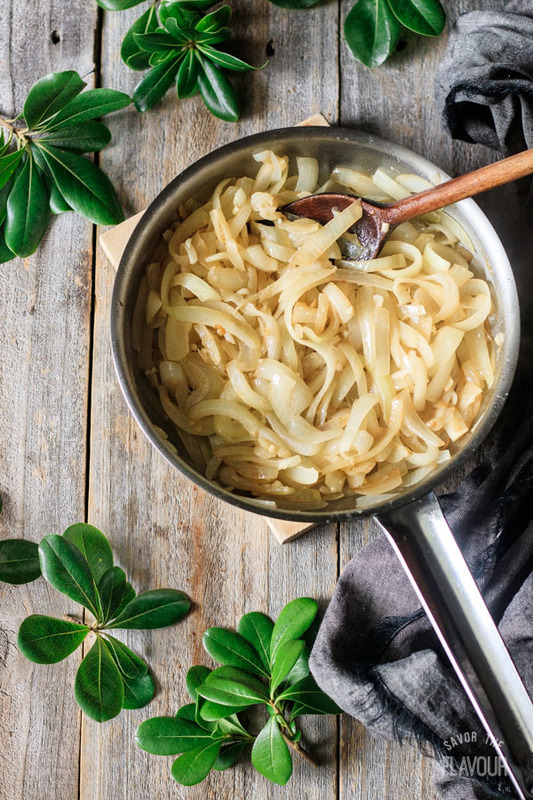 If you are on a low carb diet, this recipe should be added to your weeknight supper rotations as it has only 4 % carbs per serving. 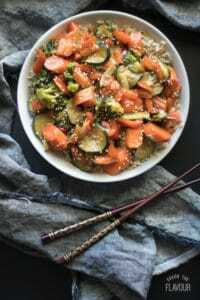 Looking for more low carb dinner recipes? Here’s some more great ones to try! 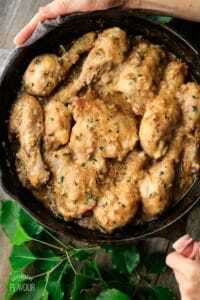 Southern Smothered Chicken: incredibly flavorful, moist chicken simmered in a mouthwatering gravy. Skillet Turkey a la King: use up leftover turkey with this creamy classic. It’s ready to eat in just over an hour! Orange Vegetable Stir Fry: a 45-minute vegetarian dinner packed with vitamin C.
Did you make this Italian sausage, peppers, and onions? We’d love to hear your thoughts on it in the comments below. Low carb Italian sausage, peppers, and onions is a healthy one hour dinner recipe that will quickly be one of your family’s favorite comfort foods. 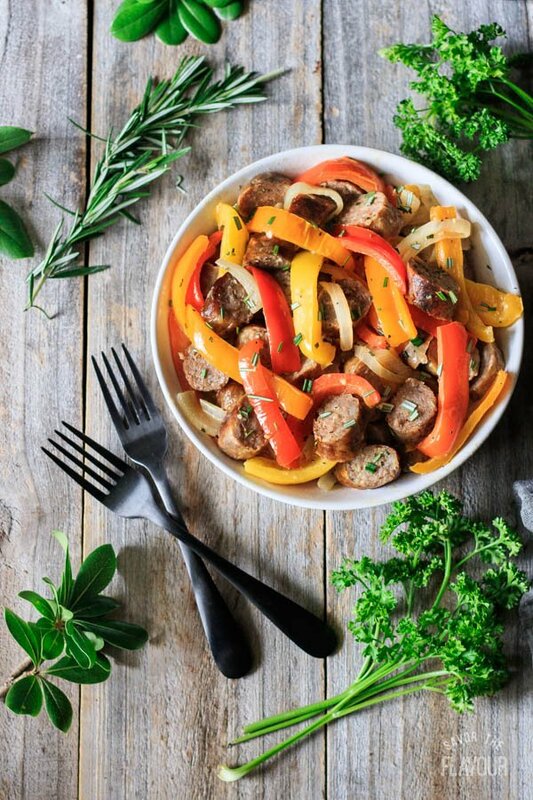 Cook it in a skillet or on a sheet pan—either way it’s an easy meal that combines sweet and mild sausage with yellow, orange, and red peppers. It’s simple and delicious! 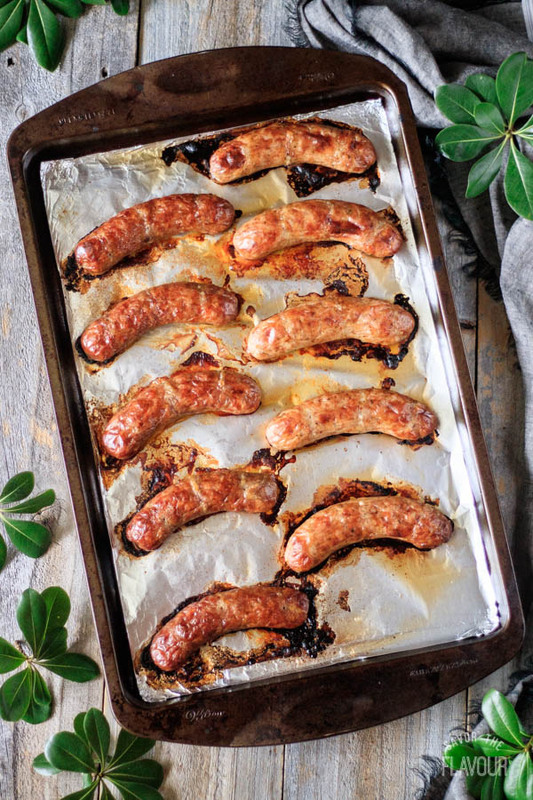 Preheat the oven to 350 F. Prick each sausage link with a fork in three different spots to let the steam escape. 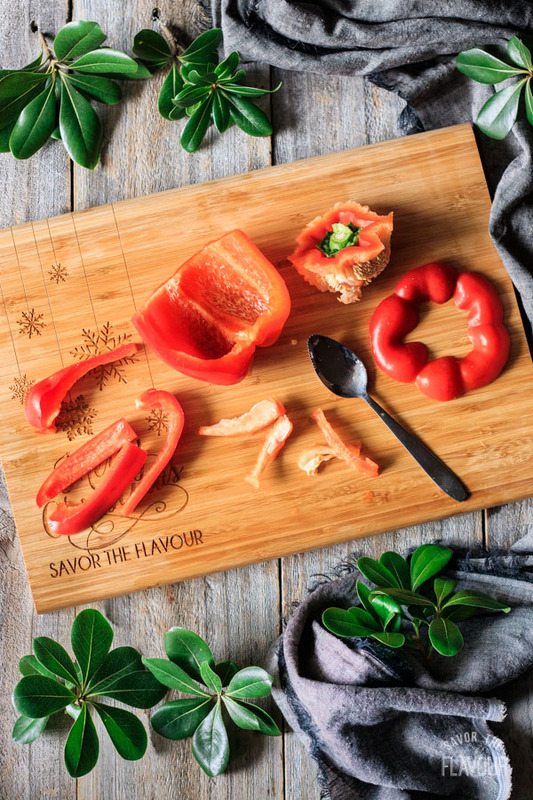 Place on a cookie sheet or a 9×13-inch baking pan. Cook for 50 minutes uncovered. While the sausage cooks, wash and slice the peppers. Melt 3 tablespoons of butter in a large saucepan and cook the peppers, stirring occasionally. While the peppers cook, slice the onion. In a medium saucepan, melt two tablespoons of butter. Saute the onion for a few minutes. Mince the garlic, then add it to the onions. Cook until fragrant. Put the peppers, onion, and garlic in a large bowl. 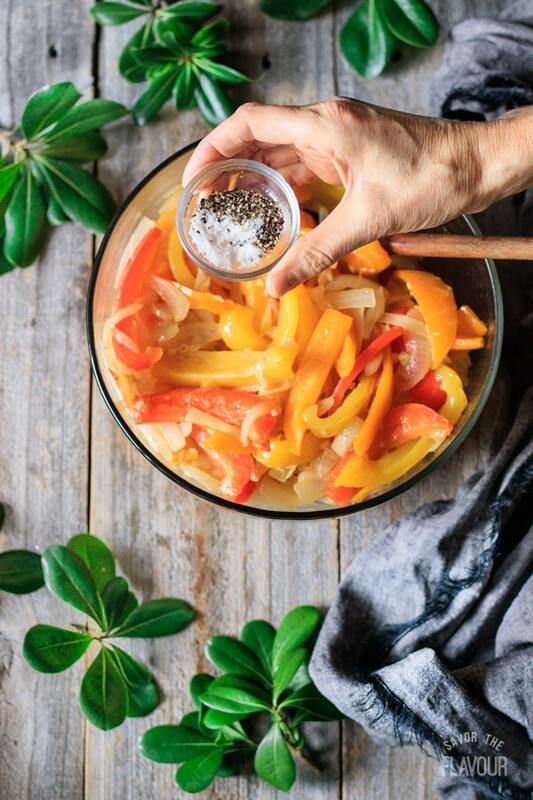 While the vegetables are still warm, add the white wine vinegar and a good sprinkle of salt and pepper. Stir to combine. Rinse and chop the fresh rosemary for extra flavor and for a garnish. After 50 minutes, remove the sausage from the oven. Slice each sausage link on the diagonal into 5 pieces. Add to the bowl of cooked peppers and onions. Add the fresh rosemary and stir. Serve warm. Store leftovers covered in the fridge for 3 days or freeze for up to 3 months.